PhD Student Exchange with KCL (Department of War Studies) will launch! 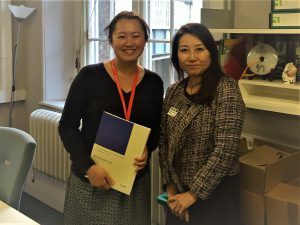 A Memorandum of Understanding on Exchange of PhD students between GraSPP and the Department of War Studies, King’s College London, was signed by Dean Akio Takahara and Prof. Funmi Olonisakin on 26 November 2018. This is the first exchange agreement between the University of Tokyo and King’s College London. Below Professor Chiyuki Aoi from GraSPP delivers the signed MOU to Partnerships Manager Ms. Bee Ong, Global Engagement.